Several years ago, while attending my first digital signage expo, a friend who is an A/V industry veteran said, “In a few years, every flat surface will have the potential for being a piece of digital signage.” He called it. Now, after purchasing your digital signage equipment—the flat-panel display, the media player, the content management server and cabling—and arranging for the necessary labor and technicians, the next question is: How am I going to mount all of this? Before anything can be mounted, we must consider some factors. What kind of digital signage are we looking for? What's the application? Who's going to be looking at the message? Let's look at some of the applications and purposes of digital signage, and then at some of the mounts and mounting techniques that might be appropriate. Public space and public information is probably where most folks are noticing the ever-increasing presence of digital signage. Whether in an airport, a doctor's office, the waiting area of a restaurant or a bank, digital signage proves to be informative while simultaneously reducing the perceived wait time. In the case of an airport, you are dealing with large, open areas that can be affected by light, as well as limited wall space for mounting a display. A ceiling mount would be perfect here. It can be more centrally located, allowing viewing from a multitude of angles, while also managing light and glare from the outside. In the case of a doctor's office or the waiting area of a restaurant, these areas are generally more contained, with several wall-mounting surfaces. In these situations, you have to consider to tilt or not to tilt. Chances are, the display will be mounted 7 to 10 feet from the floor, and it might be difficult to view the screen from close distances. A slight tilt will enhance the viewing experience for everyone. If the area is less confined and there is more seating and less standing, tilt might not be necessary, but more displays may be required to keep everyone happy. A bank has an open feel with strong, unobstructed lines of sight, but the crowd is controlled and directed to specific destinations. A ceiling mount that won't compromise security and visibility might be just the ticket. For foodservice menus, the days of the handle-crank menu boards are gone and replaced with digital menu boards capable of changing from breakfast to lunch to dinner with just a couple of keystrokes. Display placement in these establishments is very consistent: above and behind the order stations. This keeps the patrons moving in a forward direction. A mount with a slight tilt would be most appropriate here. Another consideration for multiple-display setups is to choose a mount that can be installed like a daisy chain. Some manufacturers offer mounts that can be installed along a single row of interconnecting mounting plates, which will provide a level installation with consistent increments of tilt to ensure a near seamless display. These mounts will usually also allow for the necessary spacing behind the displays to accommodate the small content management CPUs. Let's look at delivering content in a setting such as a school or corporate office. As students enter the lobby of a school in the morning, they can be greeted with informative messages about after-school activities, safety messages or other pertinent programming. These displays are probably best kept at heights that will reduce accessibility, which requires a ceiling mount. In some cases, you may have a central area that is serviced from two different feeder hallways. Here, it makes sense to install a back-to-back two-display setup so messages can be viewed regardless of the students' entry point. In corporate settings where you are dealing with a low-impact viewing audience, content may include welcome messages for special guests, company announcements and activities. This can easily be viewed using mounting systems that don't incorporate any tilt. Advertising and brand building go hand-in-hand. Retail establishments are vibrant, which makes them unpredictable from a mount standpoint. Chances are, you will need a combination of wall and ceiling mounts to deliver messages to the not-so-captive-audience. Ceiling mounts could be used to draw attention from a distance to a certain brand, product or sale. On the other hand, a wall mount with a small degree of tilt may serve to entrench a message about a specific product, service or brand once the customer has wandered into the draw area. Considering that any flat surface has the potential to be a digital sign, some venues have created interactive displays designed to get the audience involved. Most commonly, tourist attractions and museums will use these dynamic pathways that are typically built into the floor to direct people to activities or new exhibits. These are usually very effective with young families, as it will engage the youngsters down a path of learning and adventure and, ultimately, direct them and their parents into the gift shop. Mission accomplished. We've touched on several applications here, but there are plenty more, including video walls, freestanding displays, pole mounts and touchscreens, to name just a few, each with their own nuances and applications. I've often said that mount companies are the low-tech guys in a high-tech world. 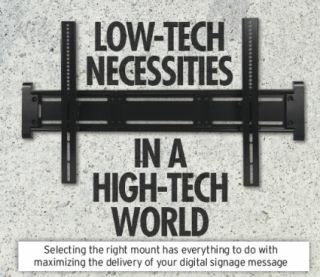 Make no mistake; selecting the right mount has everything to do with maximizing the delivery of your message. It'll take patience, creativity, some high-tech equipment and quality content to make it all work. But at the end of the day, without the right mount, it makes for an ugly pile of bells and whistles. Keith Fulmer is president of Video Mount Products.